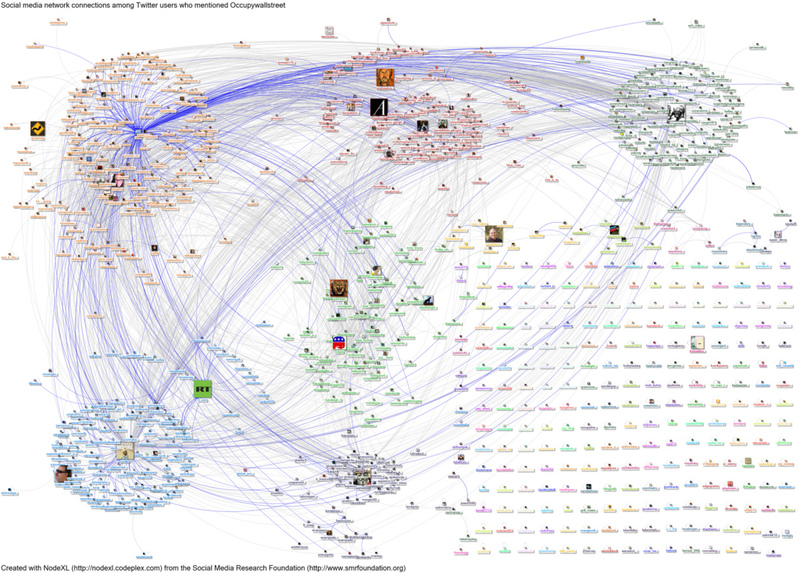 These are the connections among the Twitter users who recently tweeted the word occupywallstreet when queried on November 15, 2011, scaled by numbers of followers (with outliers thresholded). Connections created when users reply, mention or follow one another. Relies and mentions edges are highlighted in blue, follows connections are grey. The data set starts on 11/15/2011 23:08 and ends on 11/15/2011 23:34 UTC, a total of 26 minutes of traffic. 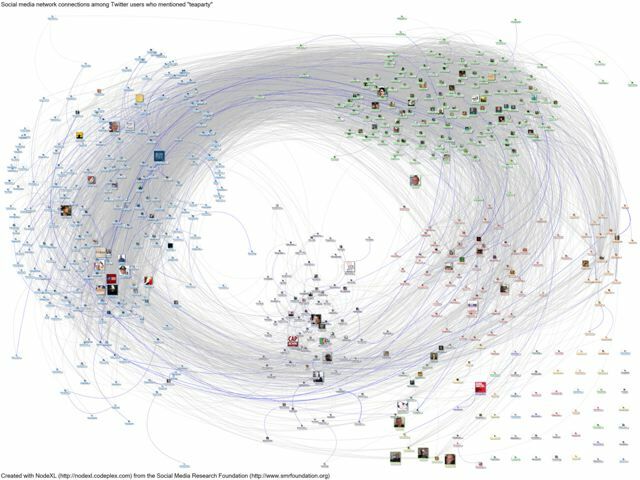 These are the connections among the Twitter users who recently tweeted the word teaparty when queried on November 15, 2011, scaled by numbers of followers (with outliers thresholded). Connections created when users reply, mention or follow one another. Relies and mentions edges are highlighted in blue, follows connections are grey. The data set starts on 11/15/2011 14:22 UTC and ends on 11/15/2011 17:23, a total of 3 hours and 1 minute of traffic. Compared to Occupy, the Tea Party supporters have a much denser network of following relationships. “The Tea Party is an ‘in group’ thing,” Smith argues. But for now, at least, the conversation within this group is muted compared to that surrounding Occupy—not only is the rate of tweets much slower, but fewer of the relationships show up in blue, indicating an active response to a post.